An outdoor educational experience in the middle of our community. The project originated from the desire to reduce blight in the Chandler Park neighborhood. That desire to beautify vacant land was combined with the emerging understanding of how to better utilize green infrastructure to manage stormwater. InSite Design Studio was engaged to create the design for the space. The group brought great experience in green stormwater infrastructure and innovative design to the table to help the conversation around the project. Through community meetings with the landscape architect, a design was developed that would provide a place for community members to gather; offer nice, natural scenery for residents to enjoy; and absorb stormwater into its rain gardens. Beyond that, the idea was to showcase that green infrastructure could contribute positively to overall community aesthetic. The space would serve to educate community members on how rain gardens worked to absorb rain water and demonstrate that a functional garden with native plants could also be beautiful. Chandler Park was a neighborhood that had a dynamic resident base who were active ECN members over the years and helped formulate the strategies for reducing blight. The residents were working to stabilize their neighborhood to attract investment in vacant homes and new residents. Reducing blighted land is part of the strategy to make the overall community more attractive. Because of the active resident groups and the availability of open space in the area, the site selection process narrowed down to the Chandler Park neighborhood. The specific site was narrowed down based on community input. A key element in the location of the chosen site was its adjacency to the local elementary school, Hamilton Academy. This location evolved the concept into an education tool for the school, as well as the overall community, and inspired the “Hamilton Learning Lab” name for the space. The space was also chosen because it contained a noticeable amount of vacant land that residents wanted to see improved but also was within an area of dense enough population that the space would be beneficial to and utilized by nearby residents. ECN applied for a Kresge Innovative Projects: Detroit (KIP:D) grant to finance the design and construction of the Hamilton Learning Lab. ECN was selected as one of 17 implementation projects across Detroit in April 2017 and received $130,000 to complete the project. The overall strategies for open space developed by ECN’s Lower Eastside Action Plan (LEAP) formed the structure of the conversation around the design for the Hamilton site, but community members provided their input for the specific elements that would be included. The main idea was to create a space that was usable for the community and the school, while incorporating green infrastructure to absorb stormwater and increase the overall aesthetic beauty of the neighborhood. After surveys and community conversations with the landscape architects from InSite Design Studio, a concept was developed whose main features were rain gardens with an inlet from the street and an outdoor classroom that could be used by the school for classes and the community for gatherings. Because of the educational goals of the plan, stepping stones were put into the rain gardens so people could walk through them even when the water levels were high from rain. Educational signs about water issues and green infrastructure were also incorporated into the design. The rain gardens themselves would not be the basic designs that were increasingly prevalent at households and on vacant land, but would showcase more innovative, complex methods that allow for greater retention of rainwater. The design included a curb cut to direct stormwater from the street into the rain gardens, which was not common for private GSI projects but allows for a greater impact on rainwater detention. The site consisted of three parcels that were owned by the Detroit Land Bank Authority (DLBA). ECN is a Community Partner with the DLBA, which allows the organization to acquire property from the Land Bank for the purpose of removing blight at a reduced cost. ECN purchased the parcels in June 2017 for $100 each. On June 9th, 2017, with funding secured and the parcels purchased, ECN hosted an event at the site to celebrate the kickoff of the next phase of the project. Students from Hamilton Academy and community members attended the event to celebrate the start of the project work. The design required several permits from different agencies for the construction. A plumbing permit from the Building, Safety Engineer, and Environmental Department (BSEED) was necessary because the property contained pipe leads from the houses that had previously been on the site. Our design called for a curb cut that would bring water from the street under the sidewalk and into the rain gardens. To perform this work in the Right of Way, we needed to submit plans to the Department of Public Works (DPW) who oversees these areas. We also needed to submit a petition to the City Council through the Department of Public Works to get approval from the City Council to work in the right of way. Once those departments had approved the project, the petition that had been submitted to City Council could move forward. The petition, once all entities with stake in the easement approved it, was sent to the City Clerks office and put on the docket for the Detroit City Council. The City Council then voted to pass the petition on July 31st, 2018. The Mayor approved it on August 1st, 2018 which made it final. Initially site cleanup and excavation work began in late 2017. After that, the rest of the construction required permits to move along. The initial resumption of construction was expected for May 2018 but was delayed until October 2018 because of permitting and scheduling issues. Once work began in mid-October, all of the construction was completed by early December. The final steps were installing new sidewalk and removing the final loads of debris. Because of construction finishing later in the season, planting was planned for spring 2019. 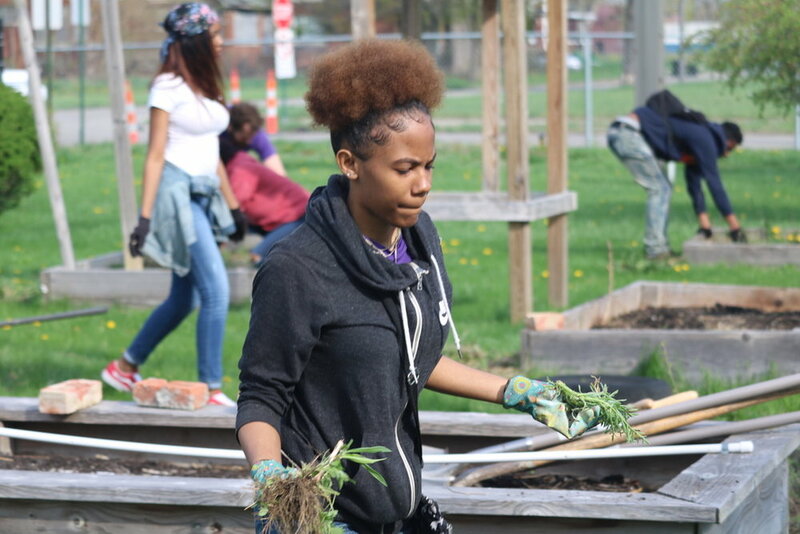 Though involving the community in open space planning may seem obvious to some, past projects related to green stormwater infrastructure in Detroit, including some by ECN, have failed due to ineffective or complete lack of community involvement. One takeaway ECN staff had from the organization’s previous rain garden projects was that they may have provided some beautification, but they lacked buy-in and appreciation from the nearby community. The Hamilton project included Chandler Park residents from the outset. They were part of the whole process and helped shape the project to include community benefits that went beyond stormwater impact. Early community involvement is key to ensure projects match the vision the community has for its spaces and will be appreciated and utilized by residents upon completion. The original timeline had construction slated to begin in May 2018. The permitting process delayed the construction by several months. Once all of the permits finally came through in August, construction was slated to begin in October. By the time the actual physical site work began, winter was nearing, and plant availability was more limited. As work progressed later into fall, planting became less advisable because the survival rate of the plants would decrease. Planting ended up being delayed until spring 2019. Delays are frustrating for everyone involved, especially when aspects of the delays are beyond one’s control. For the community, these delays can erode community members’ confidence in a project. With the project dragging out, ECN communicated the delays at meetings, reached out to residents in the area, and sent letters to the surrounding residents to ensure they understood the project was still advancing even if the site was not visibly changing. Communication through delays is key to keep residents involved and make them aware of project progress. Perhaps overly obvious, but it is essential to persevere through delays and get the project completed. For all the community confidence that can erode through project delays, seeing a project completed can reaffirm faith in an organization to get things done. Some delays are likely inevitable for any project, but the key is making sure it is not completely derailed from unforeseen circumstances. The Hamilton Learning Lab stands as a project that responds to community needs in multiple ways. The outdoor space takes formerly blighted, vacant land and turns it into a beautiful pocket park that provides a gathering space for the community and reduces stormwater impact through its green stormwater infrastructure installation. Working with the community throughout the process brought out the needs the residents were concerned about. Through this process, ECN was able to identify multiple benefits the Hamilton project could work toward. Instead of focusing just on green stormwater infrastructure, the project was able to leverage funding to include things like the stump circle to broaden the impact of the installation for the community. Green stormwater infrastructure work is important, but ,by seeking to address other community needs, we can utilize resources to increase the impact of GSI beyond just stormwater issues.